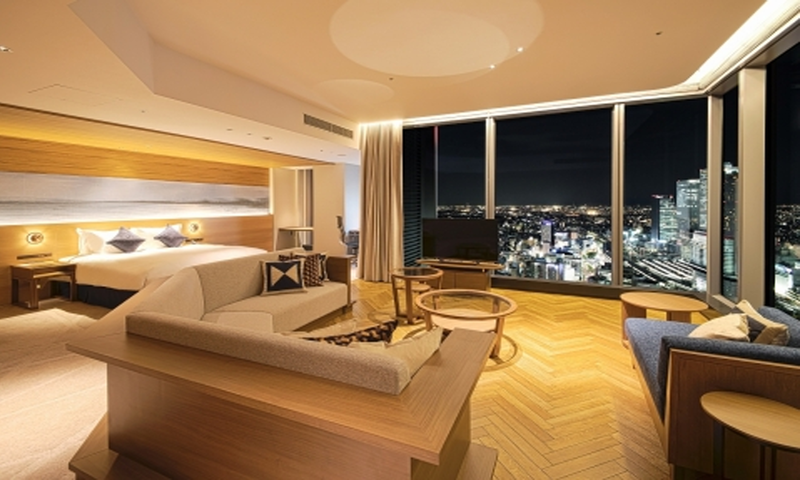 PRINCE HOTELS, INC. (Head office: Toshima-ku, Tokyo; President, Shigeyoshi Akasaka) opened a new hotel, “Nagoya Prince Hotel Sky Tower,” on Monday, October 2, 2017 in Nagoya, Japan, the country’s third largest city. The hotel is located on the 31st to 36th floors of Global Gate, a mixed-use complex erected in a redevelopment area south of Nagoya Station. In addition to all 170 rooms offering panoramic views, there is also a 110-seat restaurant, 40-seat Club Lounge, fitness room, and business center. The lobby features a 30 m high atrium that spans from the 31st to 36th floors, imparting a dramatic sense of spaciousness. The restaurant, situated some 140 meters above ground level, offers a sweeping vista and features buffet style dining with emphasis on Mediterranean cuisine. For breakfast, Nagoya-meshi, which consists of dishes particular to the food culture of Nagoya such as hitsumabushi eel on rice, tenmusu rice balls filled with shrimp tempura and kishimen flat-strip noodles, will be served along with ogura toast red bean paste on toast, allowing guests visiting from overseas to savor local delicacies while inside the hotel. This hotel represents Prince Hotel’s first foray into Nagoya, a city whose most prominent feature is its accessibility to Japanese culture and history. Aichi prefecture, where Nagoya is located, is composed of what historically was Owari and Mikawa provinces, and the three samurai (Nobunaga Oda [1534-1582], Hideyoshi Toyotomi [1537-1598], Ieyasu Tokugawa [1542-1616]) responsible for unifying Japan during the Warring States period who all hailed from this area. Nagoya Castle, located about a 15 minute drive from the hotel, was built in 1609 by decree of Ieyasu Tokugawa. Although it was destroyed by fire during the World War, it was later rebuilt in 1959. On the south side of where Nagoya Castle once existed, the city of Nagoya is investing 15 billion yen in restoration work of Honmaru Palace, home of the feudal lords. Partial construction completed in May 2013, and it is now open to the public. Nagoya also happens to be at the midway point along the Golden Route, a sightseeing route that connects Tokyo and Osaka and is highly popular with foreign tourists visiting Japan. There are also plans to complete development of the Linear Chuo Shinkansen Line by 2027 which this bullet train will connect Tokyo to Nagoya in around 40 minutes. This is expected to draw even more attention to the area.